We would like to thank our customers for their enthusiasm and participation in our discounted "Project of the Month" specials. The project for this month is the "Cocoon Jacket Kit". 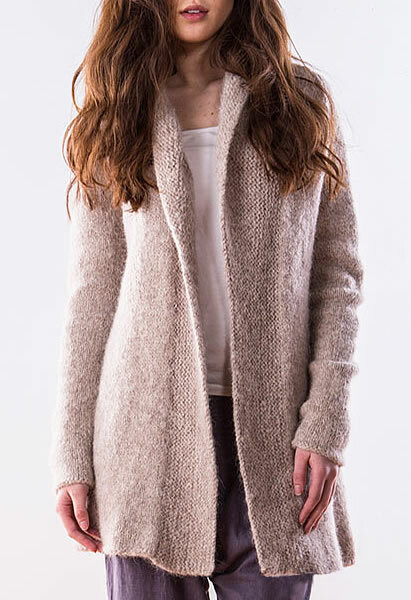 The Cocoon jacket is knitted in Berroco - North Star, a soft blend of 92% Alpaca and 8% Nylon that comes in a choice of seven beautiful, natural colors. Please note that this garment was designed with approximately 3”-9” of ease. The fronts have quite a bit of overlap so the fit is very forgiving. Please take this into consideration when selecting the finished size measurements. The finished measurements given are with the bust of the jacket overlapped. This is a super easy pattern and knits up quickly in Stocking stitch on size 10.5 (6.5mm) needles. Body of this garment is worked in one piece to the underarms, then divided for back and fronts. Back and fronts are worked separately with raglan armholes. Sleeves are knit in the round, (can be knitted flat and sewn up later) with raglan caps worked flat. Collar and frontbands are picked up around entire front/neck edge and are shaped using short rows. The kit is 10% off the regular price of buying the pattern and yarn separately. Plus, our Knit N Save Club members get an additional 5% off in the cart! - Size 10 US (6.5mm) 36” Circular Needles. Do You Belong to Our Club? *A Note about the Club if you are just signing up: Your discount won't show up in your cart until you've received your membership confirmation e-mail from Hampton Knitting Yarn. This usually takes about an hour after you have joined, sometimes less, (if joining before 3pm EST M-F). Click HERE for more information on how to join the club.